I went to Super H on Friday evening arriving around 8 PM. The frenzy in the food court rivaled Mitsuwa midday on a weekend. I quickly resolved in my mind I needed to eat before I explored the store. Otherwise the entire store would be hauled home! I have often commented on the difficulties communicating in Korean restaurants. I found talking to the food court counter people at Super H not particularly easy. However on all occasions, other Koreans standing in line with me, who were likely 1st generation Americans, were very eager to explain, suggest as well as interpret. When I admired the food at the tables around me, they not only explained what I needed to know, they were happy to point out which booth and how to order it. I can see some breakthrough in my Korean food knowledge is possible by hanging out at this store, especially the food court. The first thing to speak to me was the Dumpling booth. 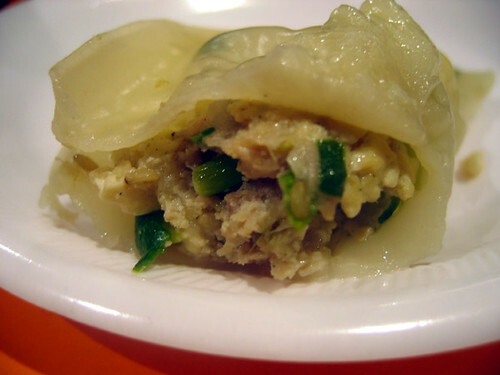 I saw people eating plates of dumplings, which triggered a keen interest. 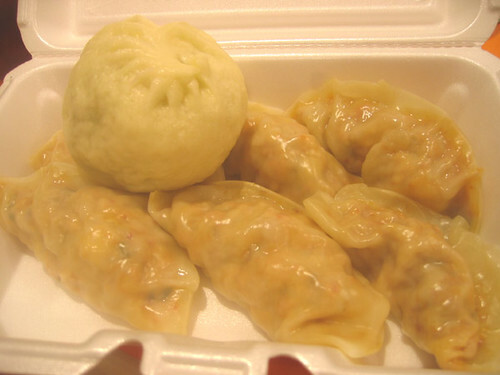 There were no problems identifying where to obtain the dumplings because the booth is labeled: dumplings. I threaded my way through the crowd to find large pictures of dumplings: steamed mandoo referred to as 'Traditional Korean dumpling,' 'Jumbo dumpling' which they had no more, Kimchi dumpling (looking like jumbo navels) available in 15 minutes and red bean filled dumpling though really a rice bun though very abundantly filled. 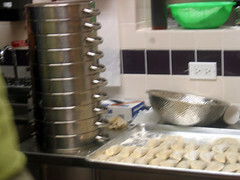 While in line waiting, I observed these dumplings were not fresh from the freezer instead they were freshly made. When I finally had an opportunity to eat one, the ingredients were obviously very fresh. 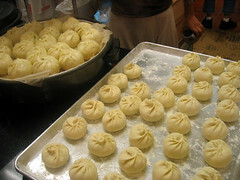 Not only are the fillings fresh, when I returned Sunday evening I saw a worker actively kneading dumpling dough in the rear. 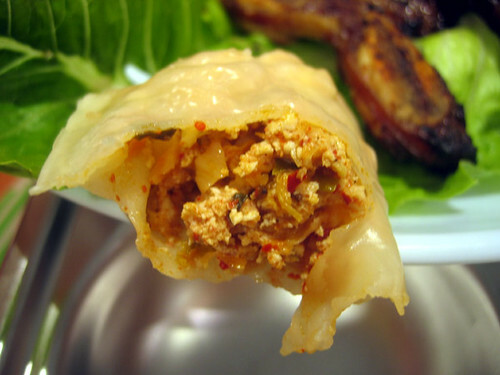 When I returned on Sunday evening, I had the Jumbo dumpling as well as the Kimchi dumplings. There are two booths: Snacks and another called Korean with some overlap in these two booths offerings. 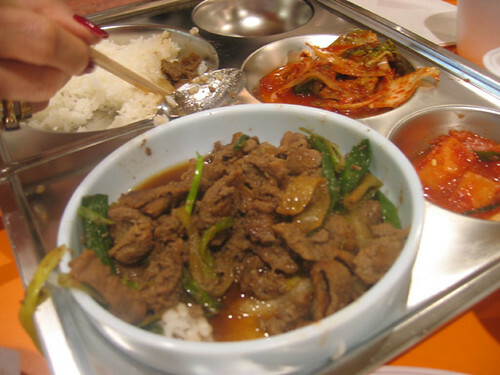 For instance, Snacks serves bulgogi over rice for approximately $5, while the Korean booth next door serves a dinner portion of bulgogi for $9.99. At Snacks, they are not offering their full menu yet. There are many items like Korean pancake, which are taped over presently at Snacks. Korean next door has a handwritten menu pasted on the counter in Korean with English transliteration, by Sunday these were machine printed. Next to this menu is another with English explanations of the food offered in the Korean- English transliterations. We ordered bulgogi dinner from the Korean booth. When I inquired how long I needed to wait, the order taker gave me a puzzled look. The woman next in line asked in Korean, then advised me the answer. This was a very typical exchange all evening. From Snacks, we ordered homemade noodles. The server advised these noodles would come in a soup. I watched them for a while, even took a picture, which they advised they didn't like. The noodles were absolutely fresh. However, the water they tossed them into wasn't boiling or even a vigorous simmer, then they added more water causing the pot to cool further. It was no surprise these noodles were gummy. I attribute this to start-up stress as well as the very eager attention so early on by customers. I will try these another day when they have polished their act, because anything beginning with fresh noodles is just worth revisiting. At the next table, I saw people enjoying the Korean-Chinese favorite Ja Jang Myun, which is noodles with a sauce dominated by black beans. The people caught my admiring look, then advised the Chinese offered was Korean style, which does not surprise me. It is also the only booth, so far, where you can buy a soda pop. There is a Korean bakery booth with goods made to Korean tastes. The novelty breads in a stand alone display have little boxes filled with samples to grab with a toothpick. Since everything is new (to me at least), it was great fun to taste your way around the stand. From the novelty bread section I purchased a muffin-type snack cake, which had various bean pastes, raisins and nuts inside. A friend made a comparison to a heavily fruited fruit cake, though more interesting and better tasting in my opinion. 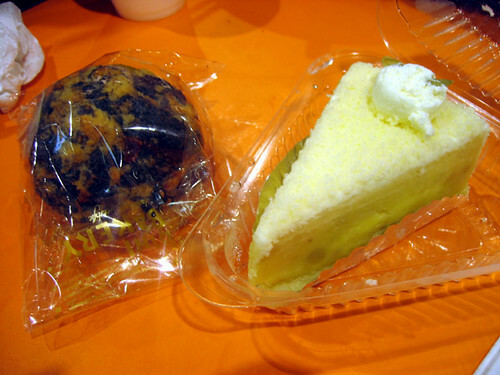 From the refrigerated section, I bought a sweet potato cake slice with a cheesecake texture. As we picked our way through this cake slice, we did find a piece of potato. The whipped cream decoration with two sunflower seeds embedded was not whipped cream. I estimate it was whipped crème fraiche. Both bakery items were both worthy of repeat purchases. There was only one booth where there were few lines and less customer enthusiasm: Japanese sushi and noodle soups. Shopping afterwards is great entertainment. That looks almost good enough to get me out of the house today. This week I will be there for lunch for sure. How was the Kalbi? I love grilled shortribs, but the last experience I had with them was pretty disappointing (extremely chewy). Since then, I have stuck to making my own. I often have errands to run in the vicinity of H-Mart. Once the crowds thin-out a little, it will be nice to have a place to pick-up some quick and interesting food-to-go. was there this weekend, didn't find the food court that great. at the snacks counter, ordered the rice cakes w/ hot sauce (duk bok gi), and that was pretty decent and plentiful for ~6 bucks. also ordered the 1 person ja jung myun (the 2 person stir fried version comes with vegetables and seafood, it seems), and found it somewhat bland. the end was also a bit too soupy, i think they didn't completely strain the noodles. alas. 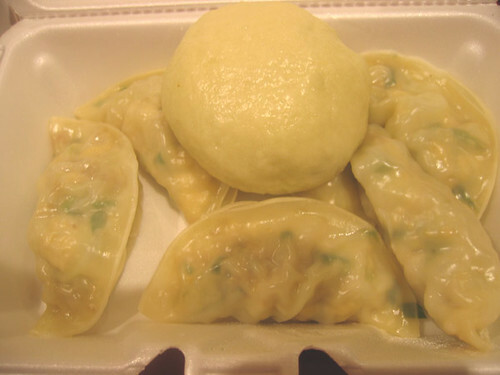 i would also avoid the potstickers at the chinese booth (where you get the ja jung myun), i saw them just cut open a bag of frozen potstickers, available elsewhere in the market, and deep fry them. for 6 dollars, a good profit margin on that dish. I thought the Snack area didn't quite seem to have their system in place. I wasn't overly thrilled with my homemade noodles, though I will be interested in trying them later once they have found their groove. I thought the Chinese booth had the weakest offerings, though they did have Korean-Chinese favorites. Chinese had steam tables with their food sitting there waiting for a customer. 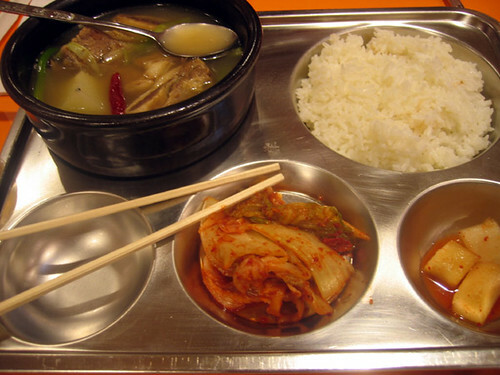 While Snack, Korean and Dumpling were preparing everything fresh and in the case of Snack and Korean to order. Sushi/Japanese also had sushi prepackaged, though soups seemed made to order. On Sunday evening, my beef ribs were cooked absolutely correctly with lots of flavor. On Monday afternoon, they seemed to feel rushed with my ribs a bit too rare. I had come back to check on my order, they promised just another minute when it probably needed a few more than that. They were not tough on either occasion. From the bakery yesterday I sampled their garlic bread, which looks like a very generous piece of cornbread. They seem to spray a garlic coating on the surface and deep fried the bread. There was a strong garlic taste on the surface with a crunchy texture, then sweet and soft in the middle. Being a Korean-American, I find Super H Mart's "food court" disappointing. The market itself is great, in my opinion. They have a great variety of Korean goods and foodstuffs but they also don't alienate themselves from other ethnicities by being strictly Korean. But to get back to the food court. 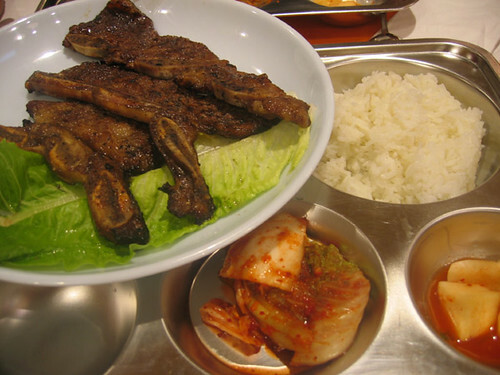 The kalbi and bulgogi are pretty standard. The marinade is pretty basic but at the same time I don't think they are trying to set some kind of standard. It is what it is and you know what to expect. Jja jjang myun was terrible. I don't understand why they bother with this. They cater to a mostly Korean clientele who are familiar with good/bad jja jjang myun. So why put out something so bad?!? The sauce was soupy when it should be thick and chock full of ingredients. This was mostly sauce. I don't want to talk about it anymore. For good jja jjang myun, I would suggest Great Beijing in Lincolnwood. The fresh noodles might have been cooked too long. When they become gummy and inedible, usually it means the noodles were sitting in the pot way too long. 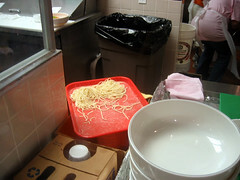 I will say that it is nice to see them making the effort to have hand-made noodles instead of using packaged ones. Like Cathy2 mentioned, maybe they just need some time to work out the kinks. I will give the fresh noodles another try in about a month. I'm not a big fan of pastries so I can't say anything about the bakery. From what I saw however, the desserts looked tasty. I will continue going there(even with the horde of people!!) and I'll probably give the food court another shot or two in a month. Hopefully by then, they'll have adjusted some of their recipes and have things running smoother. We finished it off with a steamed red bean bun which was tasty, but a little too big. I also picked up some durian popsicles to take home which were also good. Saluki9, I've been trying to get people around me to try Durian. I bought the popsicles from H mart too and thought the flavor was subtle enough for people to try. No go. Do you have trouble trying to get people to taste it? Joy Yees makes a good Durian freeze drink too. I tasted durian ice cream at the Village Creamery Sunday night. Um, yeah, I settled on a scoop of canteloupe. The Mango looked pretty tempting however. The durian had an extremely interesting, complex, stinky-foot, sort of flavor but I just couldn't face an entire cone of it. keevieweevie wrote: Saluki9, I've been trying to get people around me to try Durian. I bought the popsicles from H mart too and thought the flavor was subtle enough for people to try. No go. Do you have trouble trying to get people to taste it? Food shopping when hungry can be rather expensive with your big eyes finding everything worthy to bring home. H-Mart's food court at the shopping journey's beginning might be considered a marketing mistake. Once you have snacked or supped, then you look at food shopping with a more level head. I thoroughly enjoy dining at H-Mart whenever I go. To compare the food there to full service Korean restaurants is a disservice. However when compared to food courts at your local mall, it runs circles around them at least in my book. The best options are the Dumpling stand, the center Korean food stand and the bakery for dessert. The sushi offers the least amount of freshly prepared food. Only their inexpensive hand rolls and their $10 dragon roll are made to order. If you are going to provide your customer a photograph of your Udon soup offering, then it really is in your best interest to provide it as pictured. My friend ordered the Udon soup because it pictured three tempura shrimp in the bowl. For the price point it was a delicious steal. However only one tempura shrimp and two logs of textured UFO's were floating in the soup. The glee of the bargain was now the unpleasant feeling of bait and switch. The broth was flavorful with nice chewy noodles, though the missing tempura shrimp was a dark cloud. Interestingly, this same configuration of tempura shrimp and textured UFO's was in another bowl I purchased back in December. I guess at the time I had not paid much attention to the tempura shrimp count, though my photo was a vivid reminder. The photographs in the Snack Stand really should be revised to reflect what you will receive. I never would have ordered the tonkatsu from the photo menu, though it sure looked good enough in real life. The contents of the Udon soup should be as illustrated to avoid heaps of customer disappointment. When I was at the Snack stand last time, I enjoyed the theater a woman making Stuffed Soybean Curd (Tubu Gui) captured in a youtube photo clip here. Last edited by Cathy2 on May 30th, 2007, 7:50 pm, edited 1 time in total. Wow...your asian markets serve so much more variety than the ones out here... At the Ranch 99 (California's H Mart I think) we only have Panda Express type food, some dim sum, and roast duck. Is H-Mart the only large scale asian supermarket you guys have in Illinois? banpei wrote: Is H-Mart the only large scale asian supermarket you guys have in Illinois? Mitsuwa, and Grand Mart are the only ones that I can think of. I haven't been to the Grand Mart but it's supposed to be on Touhy @ Lehigh in the old Cub Foods location. Grand Mart is Korean, but tends to have a more "international" flair than H-mart. btw: I just found this link that has an article with more info on the Grand Mart, as well as an Assi location on Milwaukee near Dempster!!!! My go-to pre-shopping snack is the 2 for $2.50 hand rolls you picture above, Cathy! I love those. When I go to the snack shop, I generally order the tempura vegetables which are quite delicious. They have a kind of combo patty that has onion, sweet potato and I think green beans in it that's quite beautiful as well. Both H-Mart and Mitsuwa have the disadvantage that they're set up to feed you a meal, rather than a quick snack (except for the *meh* dim-sum stand at Mitsuwa). So often I'll end up at the same spot, just because I say, "eh, $5 is all I'm willing to spend, and I've had it before and it's gooooood." So at Mitsuwa, it's the Katsu Curry on the clockwise-most stand, and at H-Mart, it's the dumplings. Last Sunday we tried the Bibim Bap Dumplings, which were flavorful, but I'm not sure what made them Bibim Bap. Nice crispy fried mandu. They were served with cabbage over which a very sweet sauce was poured. Think Catalina French + chinese sweet and sour, with a couple dashes of Louisiana Hot Sauce. Tasty, but in the end too sweet and gloppy to finish. We also bought a very tasty loaf of green tea and sweet bean bread. Sort of the Asian version of cinnamon raisin bread. The one we brought home had a lot less filling than the samples they were giving out, but still delicious. On the subject of dining at H-Mart, you can't forget the samples. Sunday had a plethora, including two or three stands serving toasted laver, wine samples, and a citron syrup tea. Extremely sweet, it's a loose preserve stirred into hot water, consisting of just citron and sugar. Citron has an herbiness you don't get in lemon. Refreshing and not too astringent. We bought some and it made a good iced tea. There's always a couple of dumpling samples, and if you can time it right, other hot bits of stuff (never could get to the fried fishcakes at the right time). On a previous visit, they had a table piled high with boxes of chocolate truffles. I almost grabbed a sample cup until I saw that behind the truffles were boxes of natto, and that's what they were serving. Danger Will Robinson! Danger! I never would have ordered the Takkatsu from the photo menu, though it sure looked good enough in real life. The dish is called tonkatsu. Ton being pork. Katsu being roughly fried cutlet. Takkatsu is the name of that fine katsu restaurant located in Arlington Heights, which incidentally serves the "best" katsu "in town." 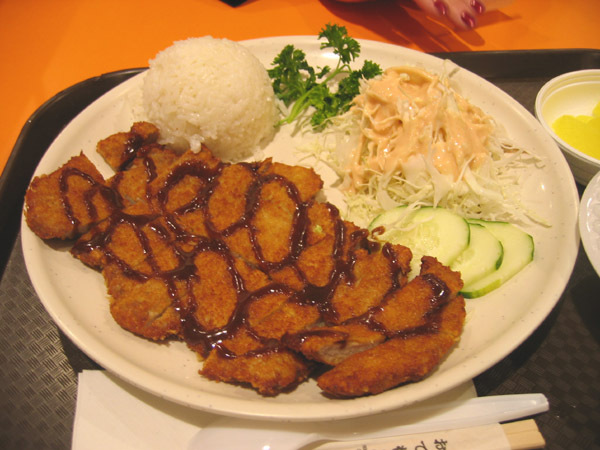 You can also have kushikatsu and menchikatsu (hamburger katsu) on occasion; Not to mention "chicken" katsu. Mitsuwa's food court sometimes has menchikatsu. 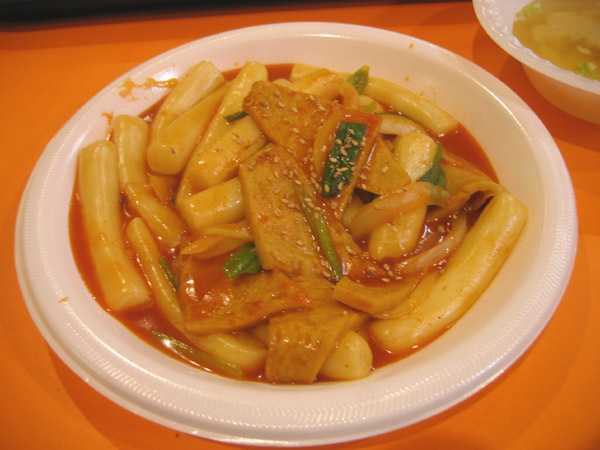 (bap/bob being rice - as in dolsot bimbimbob, hwedopbob, kimchi bokumbob) - most times you'll find it made w/ surimi. 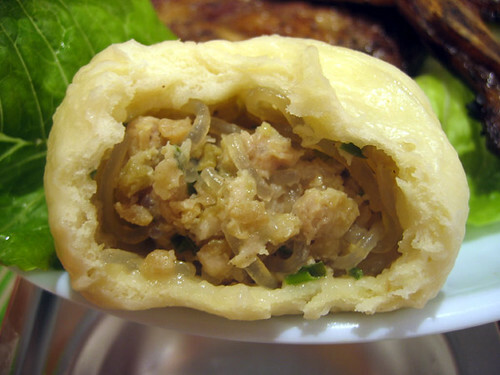 It's interesting ya'll find the dumpling stand so good; I find it horribly overpriced for what you get. I initially spelled it tonkatsu (or something close to it), then when I looked around for a post to support my spelling I failed. I will go back to edit and correct. Thanks! I have a feeling the snack venue may be the first to go or come under new management/ownership. banpei wrote: Wow...your asian markets serve so much more variety than the ones out here... At the Ranch 99 (California's H Mart I think) we only have Panda Express type food, some dim sum, and roast duck. Is H-Mart the only large scale asian supermarket you guys have in Illinois? Chicago Food Corp. in Chicago is Korean focused with other Asian foods present as well. They used to have a warehouse sized store on Pulaski until it burned down a few years ago. There is also International Club just off I-55, though it does not serve any food on the premises. Not too far from Katy's Noodles is another Asian food court and nearby Asian grocery store at International Plaza. These places plus Mitsuwa, H-Mart and Grand Mart (more international than strictly Asian) ... we really are hip deep in Asian markets. Plus there are many smaller operations with concentrations in Chinatown, Argyle, Lawrence and Dempster in Morton Grove and Milwaukee/Golf in Niles. I'm glad that H-Mart set up shop in Chicago(land), but the food court is pretty bad, even for a food court. It doesn't appear that they've put much thought into their offerings, banking instead on the fact that most will eat there simply out of convenience. Cathy, the rolls you ordered are not normally eaten with any kind of sauce (so no oversight). 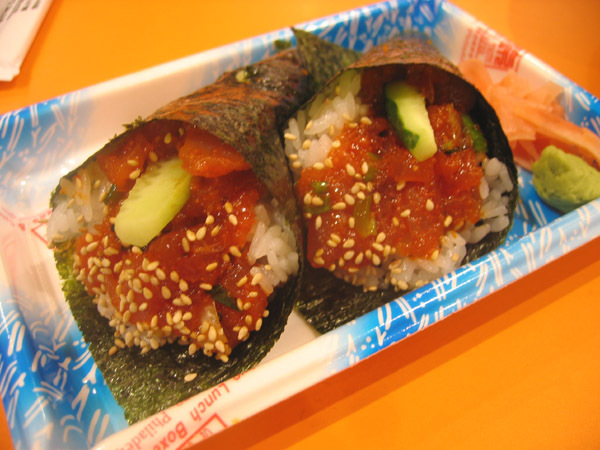 If made right, kimbap shouldn't require the help of a condiment. I quite like the Ranch 99 stores in the SF Bay Area. Since they are expanding all over, I hope they open up here in Chicago as well. The food court at the Ranch 99 in Milpitas, as I remember it, is quite cheap (particularly dim sum). The food court at H Mart is on the expensive side. DY wrote: Cathy, the rolls you ordered are not normally eaten with any kind of sauce (so no oversight). 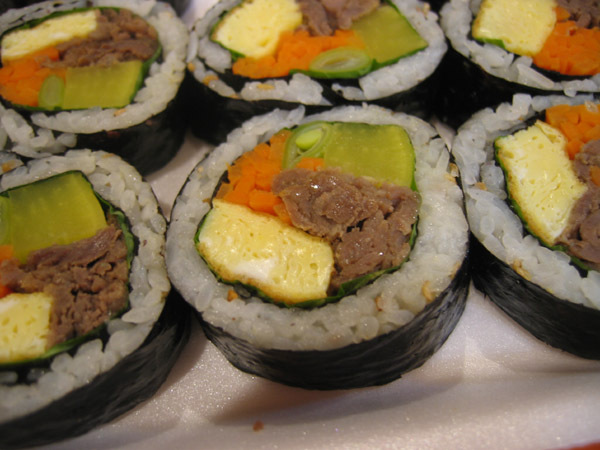 If made right, kimbap shouldn't require the help of a condiment. Thanks! I guess by that standard, these were not too exciting because they badly needed a flavorful addition. This past weekend there were a number of H-Mart trucks at the loading docks of the former Dominick's / Walgreen's at the corner of Naperville Rd. and Ogden. From the last report I believe they are planning on opening in July. Keep us posted. The opening in Niles included a laser light show. I wonder what bells and whistles we can expect this time. dined on galbi, dumplings and some sushi this past Friday, all were quite good, sushi was a bit stale so next time I'll get fresh made as opposed to grabbing pre-made. Shopping was terrific, great prices. USDA Flank steak on sale at $1.99 per lb, pre cut beef ribs for Korean BBQ at $.99 lb. excellent fresh produce and huge seafood selection. did the Naperthrill Super H open ? We visit the Super H about every 3 weeks and have the udon soup at the Snack shop each time. My 3-year-old daughter loves the noodles and broth. Good thing, because the 'seafood' component has further declined from what Kathy reported above. In early November there was no tempera but there was a smattering of tiny shrimp, mussels, etc in the soup. There was also something thin and chewy that may have been fried bean curd. For our last visit, there was no seafood, just the fried bean curd and two small sticks of Krab. Still, the noodles and broth made for a very warming lunch. 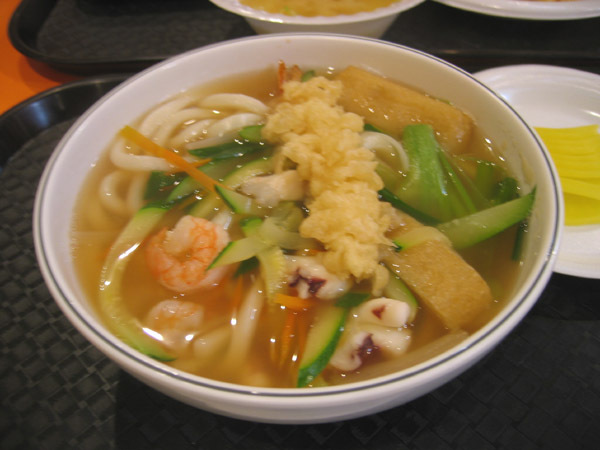 JenM wrote: We visit the Super H about every 3 weeks and have the udon soup at the Snack shop each time. My 3-year-old daughter loves the noodles and broth. Good thing, because the 'seafood' component has further declined from what Kathy reported above. In early November there was no tempera but there was a smattering of tiny shrimp, mussels, etc in the soup. There was also something thin and chewy that may have been fried bean curd. For our last visit, there was no seafood, just the fried bean curd and two small sticks of Krab. 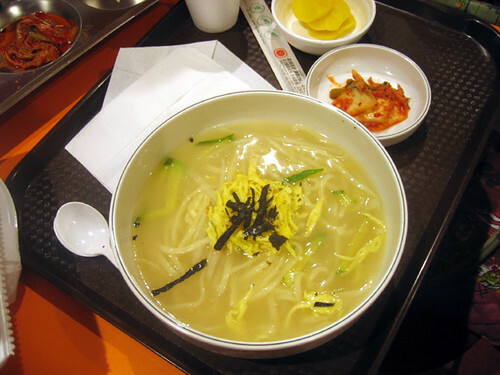 Still, the noodles and broth made for a very warming lunch.